Brief description Most versatile for the most people. Full adjustability. More portable, fewer parts, less angle adjustability. Extremely heavy duty. Designed for professional library use. Weight capacity over 25 lbs. over 25 lbs. over 25 lbs. 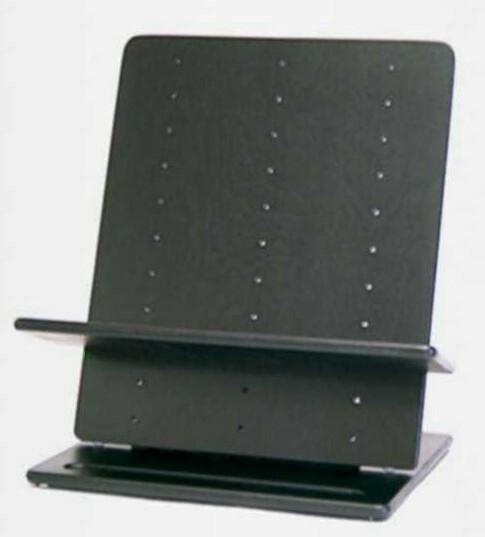 Range of shelf height adjustability 11.5" 11.5" 11.5"
Shelf (Note: all will hold documents much wider and deeper than the shelf dimensions) 14" x 3" 14" x 3" 14" x 4"
Shipping dimensions 18" x 11" 16" x 11" 20" x 12"
Weight (lbs.) 3.9 lbs. 4.9 lbs. 4.7 lbs. Description The Standard Atlas is the model that will do the most for most people. It is great for students, readers, academics, clergy, accountants, secretaries, data entry workers, writers, editors, most anyone. It is often recommended for persons with physical limitations. The Atlas Ultra is the newest product in the Atlas line. It has all the height adjustability of the Standard Atlas, but only two angles of adjustability. Like the Standard Atlas, the Ultra takes a small 11 x 11 inch footprint, but will hold documents that are much larger, wider and heavier. The Atlas-LC was specifically designed for library cataloging, in cooperation with a major US library. Its deeper shelf reflects the fact that cataloging primarily requires access to the first few pages of a book. The Atlas-LC is also useful for other extraordinarily heavy-duty tasks. Warranty All products are guaranteed for one year against defects in material and workmanship. 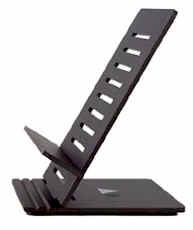 This warranty is limited to refund, replacement, or repair of the book holder at the manufacturer's option. Further details appear in the Owner's Guide.